Even though the economic expansion has been going on for 9 years, we’re still discussing the economic problems millennials are facing. The biggest reason for this is because student loan debt doesn’t go away with improvements in the economy. It’s disconcerting to see millennials doing poorly in an economic expansion because they will be hurt even more in the next recession. The people with the least savings cushion and earnings are hurt the most by recessions. The table below gives a great breakdown of millennials compared to generation X. As you can see, young adults in 2000 had a 54% marriage rate and 52% of them had children. Young adults in 2016 had a marriage rate of 41% and 42% had children. Millennials living with their parents certainly doesn’t encourage family formation. Many more young adults don’t have the means to get married and have kids. Another reason is millennials are trying to develop their careers before rearing children. This is especially true for women. Women need to get into the workforce to help the family survive. Because more women are working, marriage is no longer about financial stability for women. It makes sense that the ability to choose a mate without financial pressure makes women delay this decision or not make it at all. Many of the trends millennials are faced with are often exclusively thought of as negative, but marriage by choice instead of by implicit financial force is great for overall happiness. It’s wrong to have tunnel vision when it comes to life and only try to check the boxes (marriage, kids, etc.) instead of thinking about your options. Often financial analysis ignores this happiness quotient. 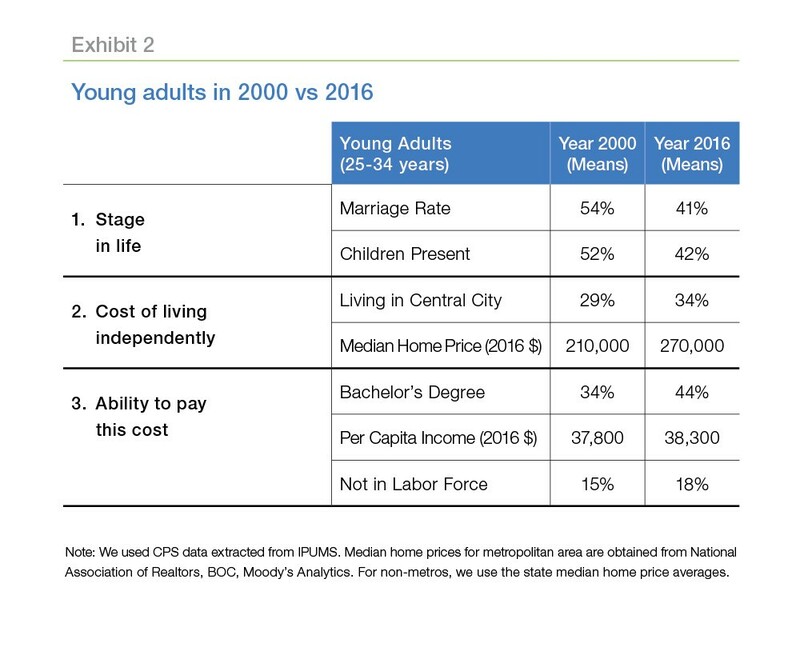 The next part of the table shows the cost of moving out for each of the past two generations. As you can see, it’s more expensive to live in central city as the median home price has risen from $210,000 to $270,000. We’ll be going into greater depth on this issue since housing affordability is the most important factor preventing millennials from moving out, but here is a few previous discussions on the topic – US Housing Is Becoming Unaffordable and Housing: There’s Good News & Bad News. The final category in the comparison table looks at the ability to pay for housing. As you can see, 10% more millennials have a bachelor’s degree than generation X’ers. The millennial generation is the most educated ever. 3% more millennials aren’t in the labor force and their per capita income adjusted to 2016 dollars is $500 more. It’s clear at the onset that housing prices went up more than salaries. Even though millennials are more educated than every other generation in history, this doesn’t mean they’re earning great salaries. Firstly, the labor participation rate for civilians with a bachelor’s degree or higher while being 25 years old and over has fallen from 79.4% in 2000 to 73.8% in 2017. Getting a degree is less of a guarantee that you will get a job. That makes sense because a degree no longer makes workers stick out from the crowd. It has become the minimal necessity to get employment. The chart below shows another disconcerting stat for college graduates. The median usual weekly nominal earnings growth for those with a bachelor’s degree and higher for 25 year olds and over has declined from 3.6% in 2000 to 1.6% in 2017. Earnings growth is decelerating for college graduates because of the supply of workers who have earned a bachelors degree. 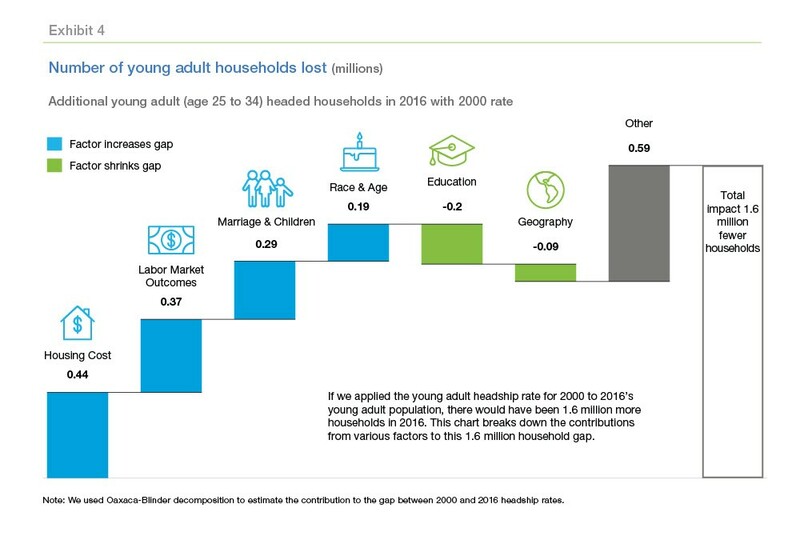 The chart below breaks down the reasons 1.6 million fewer households were created in 2016 than expected when applying the 2000 calculations to the population. The biggest reason there are fewer households is housing costs which we have reviewed previously. We already explained the second largest reason which is labor market outcomes. Wage growth is only 1.6% for college graduates. That’s not a recipe for moving out of your parents’ house and forming your own household. Fewer marriages and children also have hurt household formation. The education category has helped shrink the household formation gap in the sense that college graduates earn more than those who didn’t graduate college. However, student loan debt delays the ability to move out. 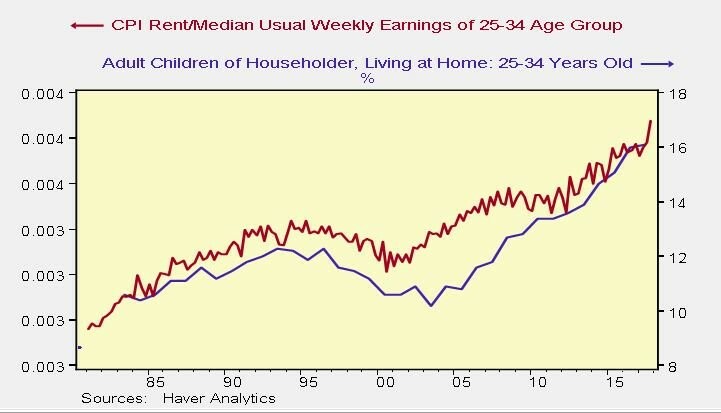 The chart below compares the rent CPI divided by the median usual weekly earnings of those ages 25-34 with the percentage of adult children ages 25-34 who are living at home. The affordability of rent is highly correlated with the ability to move out. It’s a huge generational problem that 17% of young adults live with their parents. A recession could easily spike this above 20%. 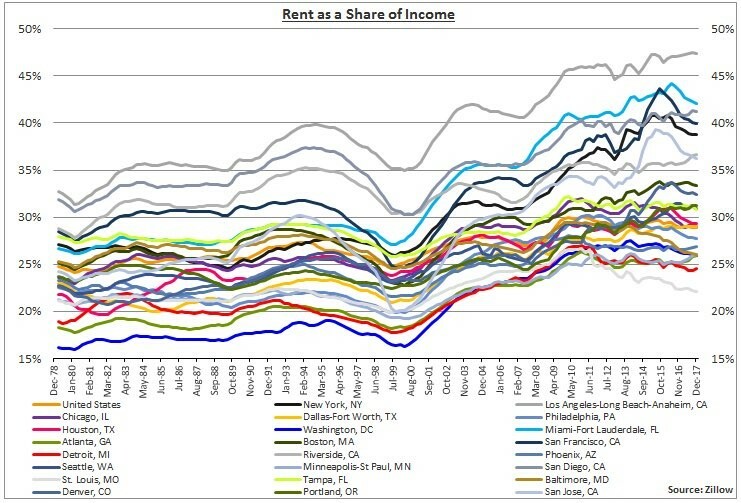 The chart below breaks down the rent as a share of income for various American cities. A basic rule of thumb is you shouldn’t spend more than 1/3rd of your after tax income on rent. However, there are seven cities in which the average rent as a share of income is above 35%. Unsurprisingly, Los Angeles leads the list of cities with greatest unaffordability as rent is almost 50% of the average person’s income. That’s a housing crisis. Socializing is an important thing to consider when looking at housing for young people. There could be a value change in which millennials care less about moving out for social reasons too, not just economic. 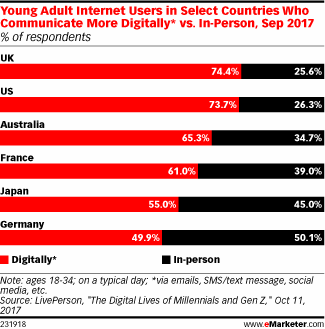 The chart below shows that 73.7% people ages 18-34 communicate more digitally than in person. The U.S. has one of the highest rates of the countries listed below. Obviously, this percentage has increased over time as the internet has gained popularity. The baby boom generation didn’t grow up with the internet. About 17% of millennials still live with their parents because of low wage growth for college graduates, high student loans, delayed marriage, and higher housing costs. Sadly the next recession will make the situation worse, not better. PreviousAre Stocks Becoming Cheaper As Price Increases? NextAre Markets Priced For Perfection?